Last weekend, the 2017 Sloan Film Summit descended on Japanese American Museum in downtown Los Angeles for three inspiring, densely informative days exploring how science and technology are depicted in onscreen entertainment—from film, to TV, to the emerging fields of VR and 360-degree video. Handsome black-and-green lanyards in tow, this year’s Sloan attendees were treated to a edifyingly dense itinerary jam-packed full of scientist and filmmaker panels, Q&As, film screenings, script readings, networking events, an interactive VR “tasting menu” and more—including free food! But even if you weren’t there, don’t worry. We’ve got you covered. Check out the 2017 Sloan Film Summit blog for in-depth recaps from this year’s key panels and case studies of recent Sloan-supported film projects. And if you’re currently developing a project featuring scientific, economic or technological themes, then perhaps you should check out the many ways that the Alfred P. Sloan Foundation can support you—offering a variety of filmmaker grants and prizes awarded in partnership with organizations like Film Independent, Sundance, Tribeca Film Institute, AFI, UCLA, USC and more. Before Opening Night’s screening of Alexandra Dean’s new documentary Bombshell: The Hedy Lamarr Story—about the life and work of the titular Hollywood-starlet-turned-pioneering-radio-technologies-inventor—Sloan attendees were treated to an in-depth panel about the role of women in both film and science. Panelist included producer/actress Diane Kruger, JPL engineer Tracy Drain and UCLA Engineering professor Danijela Cabric. 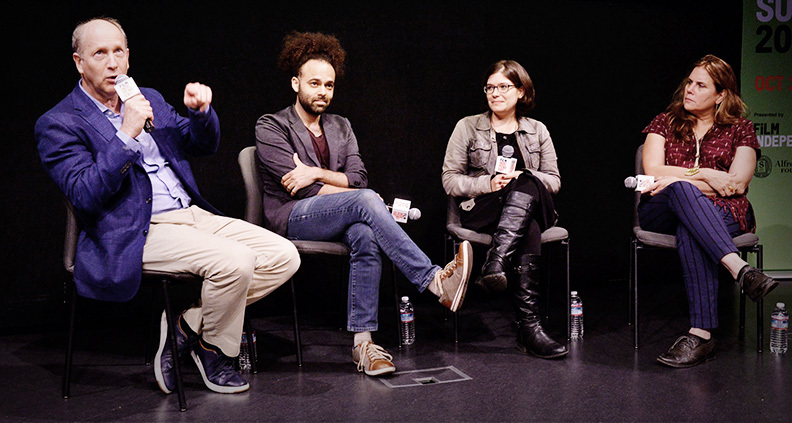 To learn how the Alfred P. Sloan Foundation is supporting films featuring relevant scientific themes, the teams behind two recent Sloan-supported indies—Operator and Experimenter—gathered to discuss each film’s unique journey to the big screen. Panelists included Experimenter producers Aimee Schoof and Isen Robbins, and Experimenter writer/director Logan Kibens and writer/director Sharon Greene. Two of filmmaking’s leading innovators gathered for a spirited conversation on the future of immersive storytelling, as new VR and AR technologies continue to create an entirely new definition of “new media.” Featuring renowned music video director, WITHIN founder and virtual reality pioneer Chris Milk and award-winning designer, academic and experiential media creator Alex McDowell. In her Closing Night keynote, producer Lydia Dean Pilcher (Queen of Katwe, The Immortal Life of Henrietta Lacks) discusses her career and how to overcome the Hollywood gender gap with the aid of hard science and statistics. Pilcher’s Sloan-supported historical drama, Radium Girls, will be in theaters next year. Check out this blog for full recaps of this year’s conference, and subscribe to Film Independent’s YouTube channel to catch full panels and highlights.